One of my little famiy's little treats is to have lunch in Pastis Restaurant. It's good practice for a five year-old, and Marcel does well. As soon as he enters the restaurant he seems to sober up, in marked contrast to many of the clientele. Last week we noticed that on the dessert menu madeleines were available, and of course we immediately ordered the entire freshly-baked stock. Marcel got his name from his mother's partiality to the films of M. Pagnol, and his father's interest in M. Proust. So the lad was immediately bored rigid with tales from his dad about Proust's eating of madeleines, how they evoked childhood memories and the like. 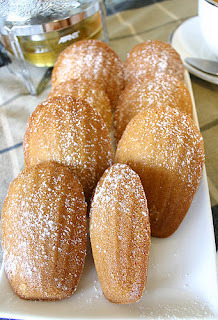 The Pastis madeleines were really good, but a bit on the small side. I decided to try and bake some myself. I strode arrogantly into the local cookware shop, fully expecting them not to have any madeleine moulds, and to be able to mutter disparagingly under my breath about the lack thereof. I was somewhat abashed to find that they had a selection. I found a recipe (there are plenty) and got going. The second lot was better than the first, probably because I put in a few drops more of the orange flower water. Everyone kept tasting them, and got so full that there was no possibility of supper. Calories per serving? Don't even think about that question. Now that the household was somnolent after gorging on madeleines, I thought some more about Proust. With his usual elegance he described a madeleine as a 'little shell of a cake, so generously sensual beneath the piety of its stern pleating'. But what about the memory part? Naively, I thought that probably not many people would have bothered their heads with this question. A quick Google showed how wrong I was. There is a veritable cottage industry of people either trying to reproduce the exact madeleine that Proust ate (had to be dry and crumbly) or spouting off about the relationship between Proust's consumption of a madeleine and his memory of his Auntie Leonie. My madeleines were so remarkably good that there was little point in bothering to reproduce Proust's. So I fixed on the second question. The whole point of Proust is, to me at any rate, the separation between chronological time and experienced time. The only time that really matters is experienced time. In his book about Proust, Alain de Botton has it right when he chides tourists for rushing through France to Combray. It is 'idolatrous', he says, because we are not experiencing the places in between origin and destination. And, anyway, Combray is a very ordinary little town, notable only for its tenuous connection with Proust. Unusual experiences led Proust to "the truth of involuntary memory," the basis for his life's work. The famous incident of the petit madeleine revealed to him a past lying dormant within him, ready to be called back to consciousness. He was able to retrieve "a feeling of inexplicable happiness" when his mother offered him the little plump cake. He was illuminated by a childhood memory (of Combray), where his Aunt Leonie on Sunday mornings used to give him a madeleine, dipping it first in her own cup of tea. It "all sprang into being, town and garden alike, from my cup of tea!" In short, the memory of a madeleine eaten as young lad had lain dormant in his subsconscious for decades, only to be suddenly evoked by another madeleine eaten in maturity. This very morning, my Marcel's first words were, "Can we have some more madeleines like last night?" Perhaps a subconscious memory is being laid down, and when he is older he will bite into another madeleine and a memory of his father will be evoked. I hope it's a warm one of a father who cares about his culinary culture. Does risk of death cause happiness?